This is the best product you can own for your face, neck, and chest. Highest quality oils, CBD synergy, and rose aroma combine to support your skin’s inner and outer glow in sun- and wind-exposed areas. Formulated for optimal skin health. This product gets rave reviews! Recommended use: With fingertip or tips gently pat a small amount of the serum onto the skin of the face, neck, and chest. 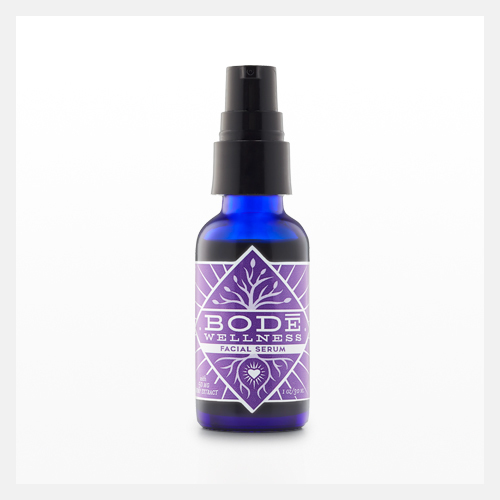 All Bode Wellness products created in a lab with Full Spectrum Hemp Extract made with hemp grown on organic Colorado soil. Extracted with no heat and light pressure to maintain the highest impact, CBDs – our easily absorbent Full Spectrum Hemp Extracts promote the Entourage effect: your body benefits from not only CBDs but also the other cannabinoids in the full spectrum (CBDV, CBD-A, CBG, CBN, CBC) that support a healthy endocannabinoid system in the body. What that means is that with the support of Bode Wellness products you feel better and your body and you give yourself the soul support for health and wellness.